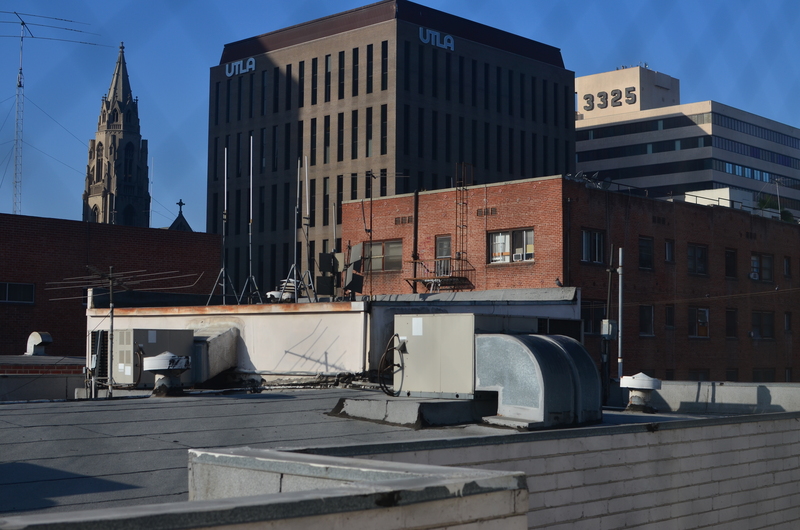 Early morning in L.A., shot through a hotel wind with a polarizing filter up front of the lens. THE DIGITAL ERA IN PHOTOGRAPHY HAS SMASHED DOWN THE DOORS TO WHAT WAS ONCE A FAIRLY EXCLUSIVE CLUBHOUSE, a select brotherhood (or sisterhood) of wizards who held all the secrets of their special science. The wizzes got great results and created “art. The rest of us slobs just took snapshots. Today, the emphasis in photographic method has shifted from understand, study and do, to do, understand and, maybe study. We are now a nation of confident what-the-hellers. Try it, and if it don’t work, try something else. In some ways, this is a shift away from intellect and toward instinct. We are all either a little less technically aware of why the magic works, or completely indifferent to the underlying processes at work. You can all huddle together and decide whether this is a good thing. Which, by way of introduction, is a way of saying that sometimes you do something that flies in the face of science or sense and it still works out. To illustrate, let us consider the humble polarizing filter, which, for me, is more important than many of the lenses I attach it to. It richens colors, cuts reflections, and eliminates the washed-out look of shots taken in intense daylight sun, as well as taming the squinty haze caused by smog. Or, if you want the Cliff’s Notes version, it makes skies blue again. Without the filter, also through the window. Haze City. Now there is a “proper” way to get top results with a polarizer. Make an “L” with your index finger and thumb, finger pointing straight up. UP in this example is the position of the sun overhead, and your thumb, about 90 degrees opposed to your finger, roughly represents your camera’s lens. The closer to 90 degrees that “L” is, the more effective the filter will be in reducing glare and boosting color. Experts will tell you that using a polarizer any other way will deliver either small or no results. That’s it. Gospel truth, science over superstition, settled argument. That’s why I can’t explain the two pictures in this post, taken just after sunrise, both with and without the filter. 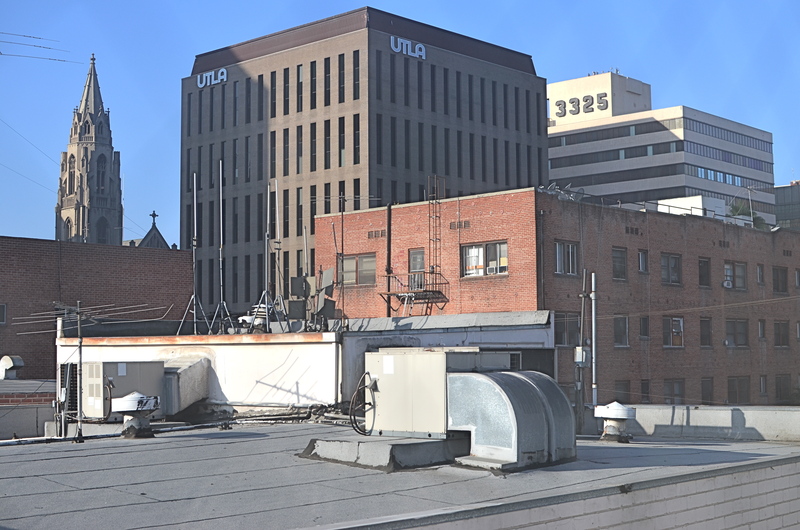 In the first, seen at left, Los Angeles’ morning haze is severe, robbing the rooftop image of contrast and impact. In the second, shown above, the sky is blue, the colors are intense and shadows are really, well, shadows. But consider: not only is the sun too low in the sky for the filter’s accepted math to work, I am standing inside a hotel room, and yet the filter still does its duty, and all is right with the world. If I had followed and obeyed package directions, this shot should not have worked. That means if I were to pre-empt myself, defaulting to what is scientific and “provable”, and ignoring my instinct, I would not even have tried this image. The takeaway: perhaps I need to preserve just enough of the ignorant noobie I once was, and let him take the wheel sometimes, even if the grown-up in me says it can’t be done. The yin and yang wrestling match between intellect and instinct is essential to photography. Too much science and you get sterility. Too much gut and you get garbage. As usual,the correct answer is provided by what you are visualizing. Here. Now. This moment. This entry was posted on October 18, 2014 by Michael Perkins. It was filed under 35mm, Architecture, Available Light, Contrast, Filters, Polarizing and was tagged with contrast, effects, glare, Polarizing Filter.